Blair Castle has been the ancient home and fortress of the Earls and Dukes of Atholl for over 725 years. Situated in the wide Strath of Garry, it commands a strategic position on the main route through the Central Scottish Highlands. This central location, in a romantic setting of mountains and rivers, makes it easily accessible from all the major Scottish centres in less than two hours. The approach from the main road at Blair Atholl is through a great avenue of lime trees which leads visitors to the white harled facade of the east front of the Castle, which during its 725 years existence has known the splendour of royal visitations, submitted to occupation by opposing forces on no less than four occasions, suffered siege and partial destruction, and changed its architectural appearance to suit the taste of many generations. During the Jacobite revolt of 1745, Bonnie Prince Charlie stayed a few days at Blair Castle on his way south with his Highland army after landing at Glenfinnan. Later, in 1746, the Castle was occupied by Hanovarian troops and laid seige to by the Atholl Brigade under Lord George Murray, making Blair the last castle in Great Britain to be besieged. The Duke of Atholl has the unique distinction of having the only remaining private army in Europe. "Blair-Athole, village and parish in Athole district, Perthshire. The village stands 35 1/4 miles north-north-west of Perth, and has a head post office with money order and telegraph departments, a railway station, a banking office, a large ornate hotel, Established, Free, and Baptist churches, and a public school with about 163 scholars. - The parish is about 27 miles long and 15 miles broad, and comprises 181,114 acres. Real property in 1880-81, £21,051. Pop., quoad civilia, 1742; quoad sacra, 1687. Strathgarry, from Struan Point to Killiecrankie Pass, is the mainly inhabited portion; Glentilt, Glenfender, Glenerichkie, and part of Strathtummel include other portions of low ground; nearly all the rest of the area is filled with the Grampians; and the whole has beem summarily noted in our article on Athole. 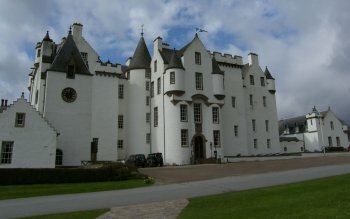 Blair Castle, the seat of the Duke of Athole, is a conspicuous feature; and Lude and Auchleeks are the chief other residences. An Episcopalian church is at Bridge of Tilt. There are 6 schools with accomodation for 358 scholars." Wilson, Rev. John, The Gazetteer of Scotland, 1882. A village in highland Perth and Kinross, situated at the junction of the Tilt and Garry rivers 34 miles north of the city of Perth. The village, which has hotels, camping and caravan facilities and a 9-hole golf course, is well situated for walks into the Grampians via Glen Tilt, the Minigaig Pass and Old Struan Path. Tourist attractions include a working corn mill, a country museum and the imposing white-harled Blair Castle which dates from the 13th century.